If you’re looking to do something awesome with a graphing calculator, [Chris] is the guy to go to. He’s literally written the book on the subject. His PartyMode project, however, has absolutely nothing to do with calculators. It’s a fantastic display of lights, colors, and sounds that has been rebuilt again and again over the years, and something [Chris] has finally gotten around to documenting. 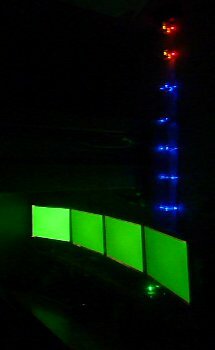 The idea for [Chris]’ PartyMode is a single button that will transform a room from a boring computer lab or dorm room into a disco with 22.4 channel sound, and computer displays used as panels of color. The first version began in the lab in his school’s EE department that included ten CRT monitors. There were a few VUFans featured on the good ‘ol Hackaday, but a few problems with regulations and politics brought this version of PartyMode to a premature end. The second version is a miniaturized, ‘press a button, get a party’ setup with a crazy number of RGB LEDs, a few more of those computer fan VU meters, and a Bluetooth app to control everything. Unlike the first version, the PartyMode 2.0 is fully independent from a computer, instead relying on an ATMega to do the audio processing and handling the Bluetooth interface. 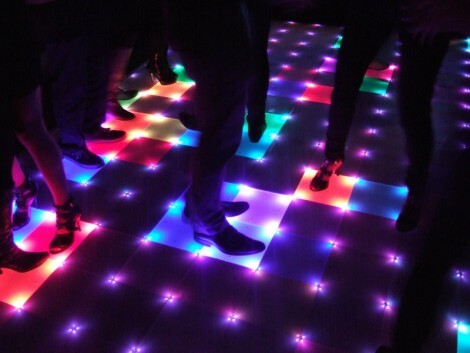 Judging from the videos below, it’s quite the site, and if you need an instant party, you could do much worse. Instructables user [lincomatic] was doing some home decorating and was trying to find something that would really tie the room together. He decided against adding a nice rug, a light fixture is what he was after. Rather than settle on a simple lamp for the corner of the room, he constructed an 8×8 RGB LED fixture he calls the Lampduino. He constructed the 8×8 grid using some leftover cardboard packaging, then got to work wiring up the LED strands. In a rather unorthodox move, he decided to wire wrap the LED leads instead of soldering them. Once the LEDs were in place, he wired everything up to his Colorduino, an Arduino derivative specially made for driving large quantities of LEDs. A thin sheet of drafting film was placed on both sides of the board, then it was mounted on a stand for display. 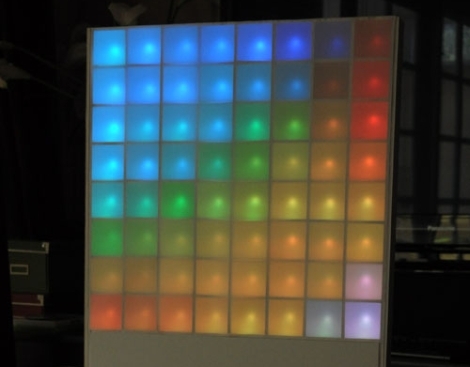 His Daft Punk-esque lamp can be programmed to display just about anything from color patterns to video game sprites, and it can also be timed to music if desired. We think it looks great, and could make for a nice wall hanging if he ever got sick of the stand. While the wire wrap technique sounds like it sped up the development of this project significantly, we would be interested in hearing how it holds up after a few months of use. Check out the trio of videos embedded below to see the Lampduino in action. David Worden let us know that he has completed work on his Disco Bar which we covered earlier. To save his bandwidth, I suggest you watch the video on YouTube.